Fortunately, finding inspiration for meals is relatively fun and easy for me. I’m so addicted to cooking new and exciting things that I literally dream and fantasize about taste sensations. Yes, People, I know I’m a sad case, but really?! Can you resist the low and slow-cooked mole with spicy pulled chicken engorged enchiladas with a goat cheese crema and a side of mango, cilantro and lime infused jasmine rice fantasy that I’m having? No? Well, touché. 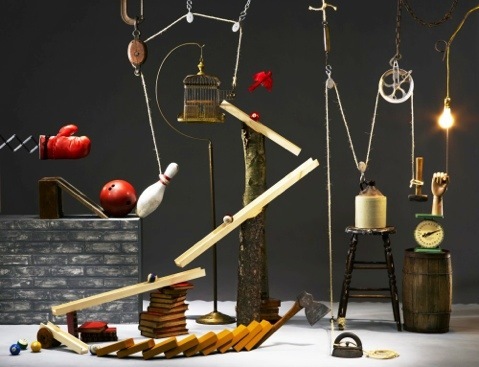 However, the process of consideration, for me, is probably akin to watching a Rube Goldberg machine operate. It usually starts with a basic craving. I want: spicy (very common for me). Or I want: sour or sweet or both. This time, you guessed it…I wanted spicy and sweet. A punctilious mental list of ingredients in the fridge, the cabinets, and pantry matching corresponding craving: we have chipotles, fresh jalapeños, ancho, and poblanos… until finally, it’s obvious that I’m considering something, say Mexican, probably with chicken, maybe with a sauce? This time cocoa was on my itemized kitchen list (because I just made White Chocolate and Almond Red Velvet Cookies) but frankly the idea of using Hershey’s cocoa struck me as outright sacrilegious. Only now, I could no longer resist the sweet suggestion of chocolate and mole. I hear that chocolate has that effect on people. 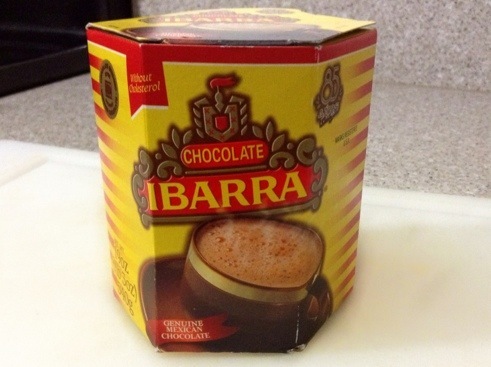 No, originally this Ibarra Mexican Chocolate was not in my cupboards. I absolutely love food blogs, don’t you? It once occurred to me that the joy I get from searching for recipes must be like someone prowling for really good drugs. My point is that (most) recipes are just recipes and even a well-written recipe is little more than a basic set of instructions which someone took the time to print or upload. But it matters when you stumble upon a really passionate food blogger or someone who takes the craft of cooking seriously and you have to make their recipes. 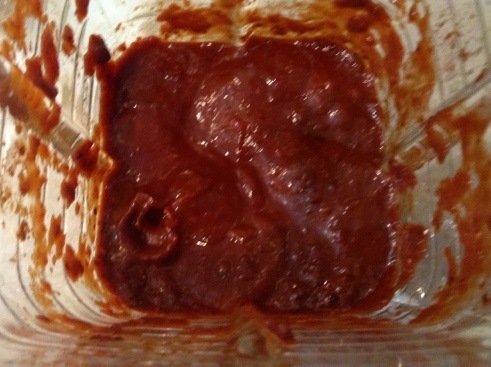 I read a number of recipes for this mole sauce but I liked the descriptiveness of one food blogger in particular, whose site is named: Macheesmo. Thank you, Nick, for educating this geek on the process of making mole sauce. In Karen Hursh Graber’s cookbook, The Cuisine of Puebla. 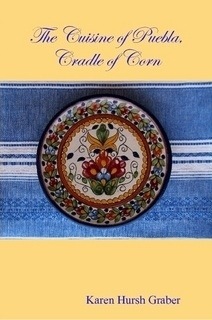 (2008, April 15), she describes a region rich in its diversity of colonial baroque dishes. Not surprisingly, the most favored and honored dish being the Mole Poblano, which is deeply rooted not only in folklore but also Puebla Mexican culture and traditions. I suspect that as far as wedding dances go, the Hokey Pokey has nothing on the Guajalote Shuffle. After perusing recipes, I quickly realized that in order to make a “traditional” mole, my previous list of ingredients wasn’t going to cut it. Which meant a trip to the grocery store. And I chose the real deal too – a Mexican mercado a couple of miles from our home. In the interest of space, allow me to just say that walking around with my iPad mini, surrounded by so many awesome food items was one of my happiest shopping experiences ever. 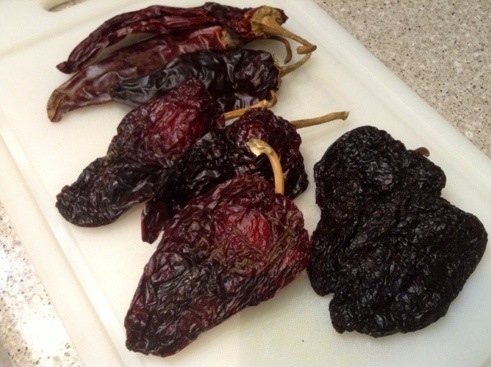 My shopping list on Evernote included: dried guajillo, ancho, and pasilla chiles. Begin this enterprise by bringing a whole chicken to boil on medium heat. This chicken broth will be added to the mole sauce and the chicken can be used in a variety of ways, in this case pulled for enchiladas. Add onion, celery, carrots, garlic, peppercorns and 2 ancho chiles and continue to cook for 3-4 hours. Don’t worry if your anchos inflate, just keep pushing them into the stock and eventually they’ll just disintegrate. Add salt modestly at this point as the flavors of the chicken and broth will intensify throughout the cooking process. 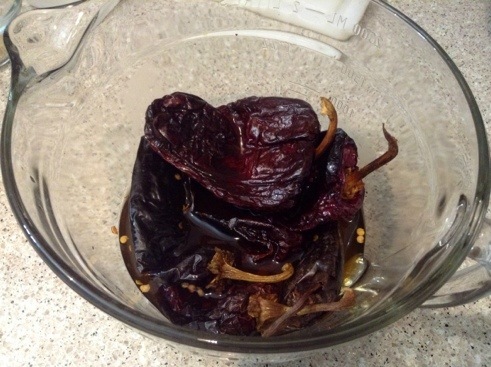 Soak the remaining dried peppers in 2 cups boiling water for 3 minutes, occasionally pressing them into the liquid as they soften until they are fully immersed. For a more intense chile flavor (and color) soak longer than 3 minutes. Once the peppers are soft, carefully slice open and remove seeds and stems. 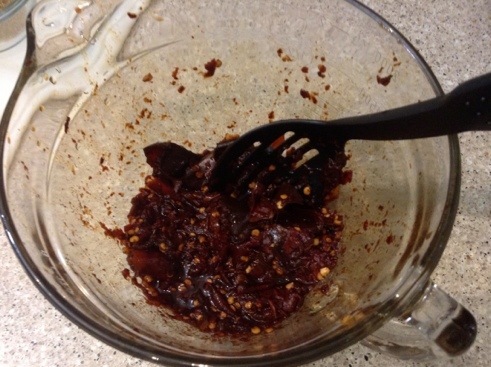 Pour chiles into a food processor and blend into a thick paste. 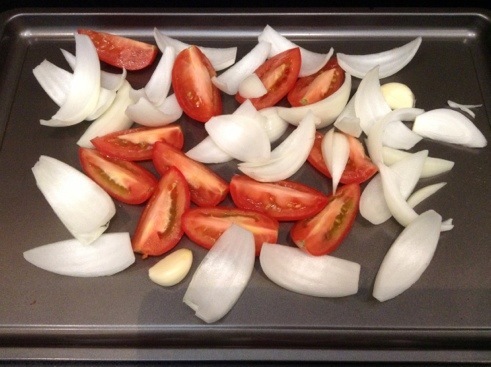 In preheated oven, roast quartered onion and tomatoes for 20 minutes. 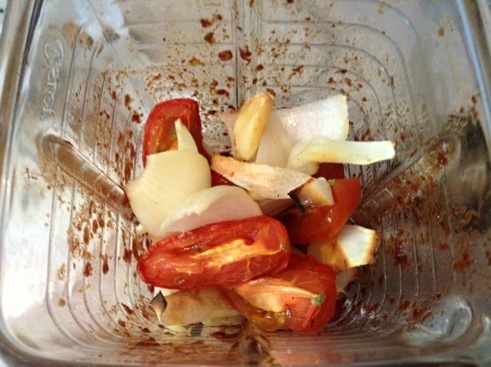 Add vegetables to food processor with chile paste and blend. 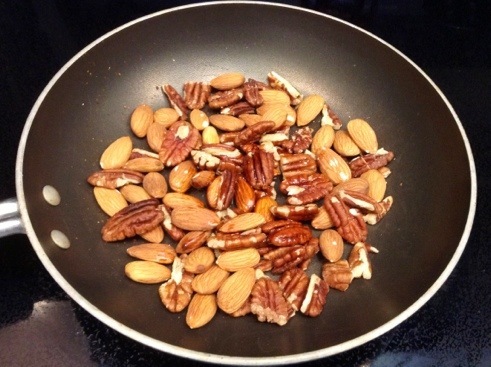 Add almonds and pecans to a small frying pan, add a tablespoon of oil, and toast the nuts until they become fragrant. 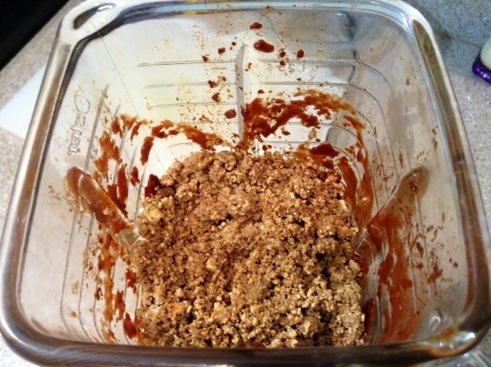 Remove from heat and blend in a grinder long enough to achieve a coarse consistency (avoid making nut butter). 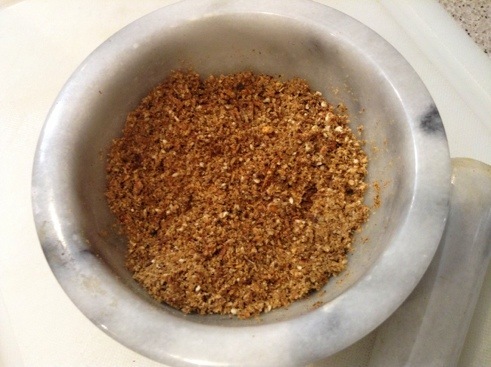 Toss the ground nuts into the vegetable mixture and blend again. Over medium heat, brown peppercorns, cinnamon, cloves, red pepper flakes and sesame seeds together until sesame seeds visibly darken and the odor of cloves and cinnamon tickle your nose. Please be careful to not burn the spices. I nearly ran out of sesame seeds because this happened to me twice (you will notice the incongruence in the spice photos). 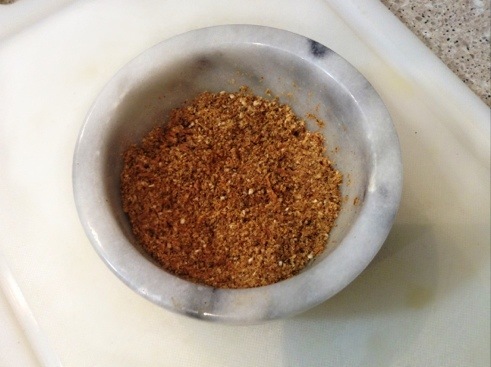 Then using a grinder or similar device (I used a mortar and pestle because I’m fancy and a glutton for punishment), blend the toasted spices until everything is pretty uniform but still grainy in texture. Set aside for now. 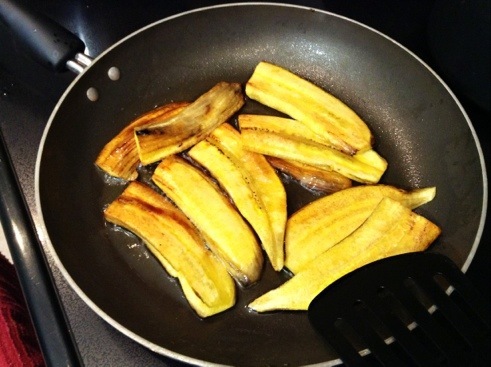 Peel and slice a plantain lengthwise then fry in corn oil for 5 minutes or until golden-brown. 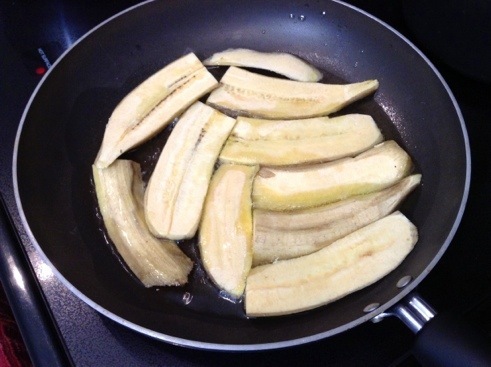 Add bananas to food processor and mix until all lumps are gone. Scoop out the mole base into a pot large; if the consistency is too thick, add just enough chicken stock to easily melt in the bar(s) of Mexican chocolate into the sauce. Cook on low, stirring the chocolate into the mole before adding 1/4 cup of sugar. Continue to cook slowly until you’re ready to add the chicken stock. 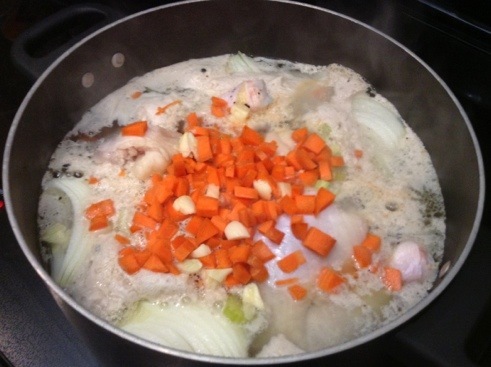 Once the chicken broth is reduced, pour off the broth from the cooked chicken (which should be falling off the bone) using a colander. 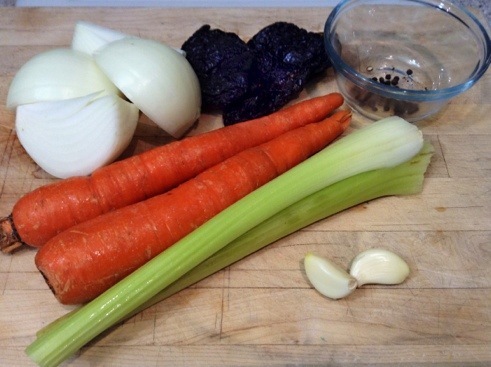 Measure 6 cups of chicken broth (less if you already added some) and mix into the simmering mole sauce. 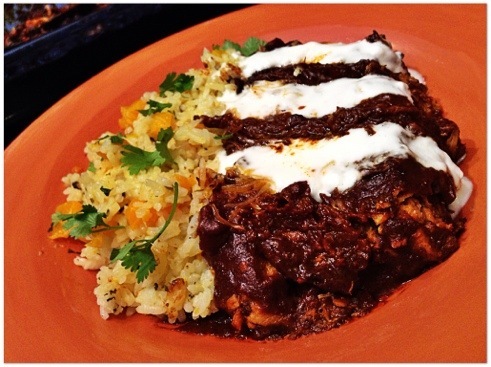 If you are making mole chicken enchiladas, allow the chicken to cool slightly before attempting to pull it apart (you’ll thank yourself later when removing the bones). In a large bowl, separate the chicken from all bones and connective matter. Using two forks is a really good method. Once the chicken is completely de-boned, cover the bowl with plastic wrap until it is time to make the enchiladas. 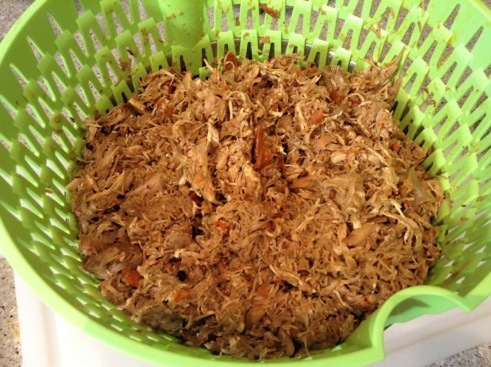 Remember that any excess chicken can saved and used for machaca chicken tacos, tostadas, or quesadillas! 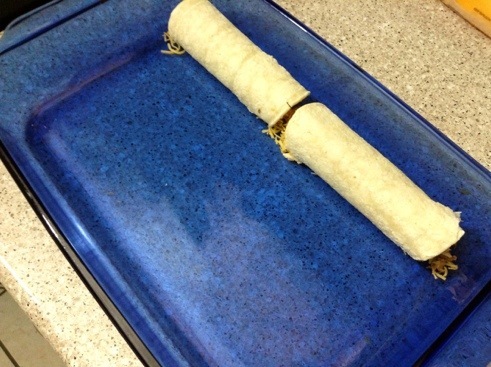 I’ll post an easy and delicious taquito recipe soon. 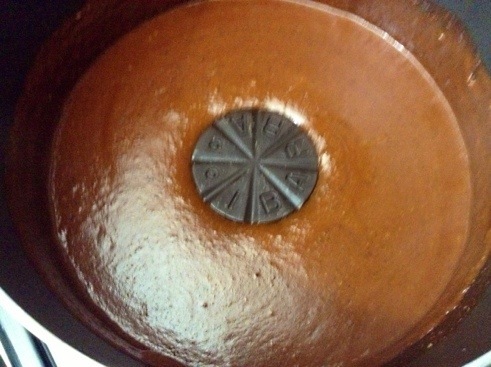 Anyhow, for mole enchiladas, start by preheating the oven to 375. 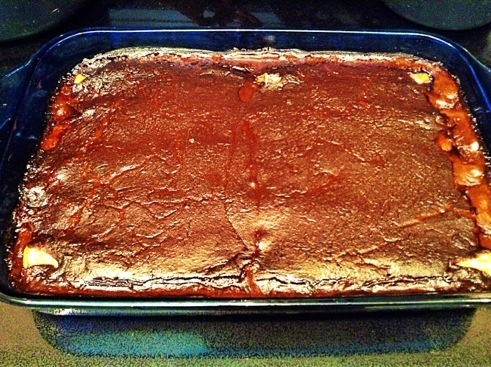 I recommend using a large baking pan here (I made 10 and easily could have produced more with a larger pan). If your a purist, you can dip the corn tortillas into the mole sauce before adding the pulled chicken, if you prefer, or you can just build your enchiladas and then add the mole. 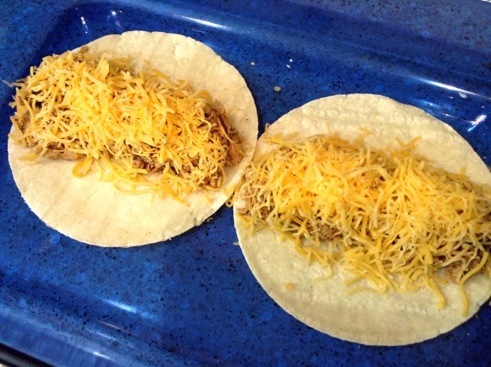 Either way, layer chicken and shredded cheese inside each corn tortilla and carefully roll. Repeat the process until you’ve filled the entire baking pan. 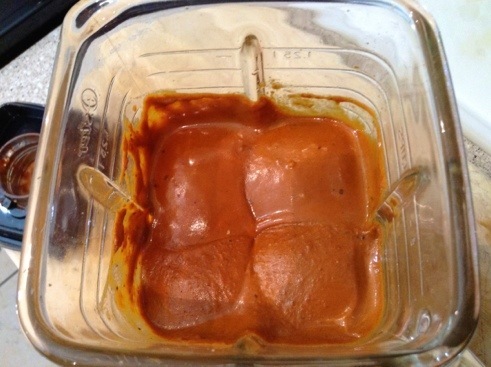 Pour any left over mole sauce over the enchiladas. 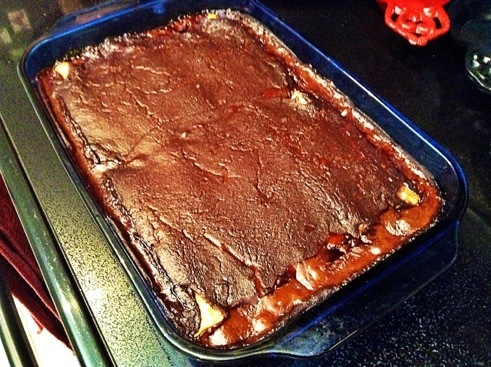 Cover with foil and bake for 20-30 minutes. Because I anticipated how spicy this mole poblano would be, I came up with a complimentary goat cheese crema to cut some of the heat. Combine 1/4 cup goat cheese or Oaxaca cheese, 1/4 cup Greek yogurt, 1/4 cup sour cream, and 1/4 cup heavy cream or creme fraiche. 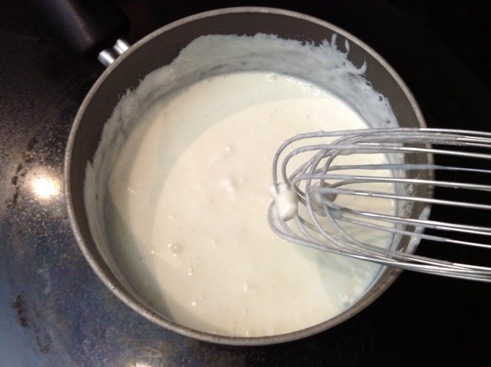 Whisk until it has a somewhat softer consistency than sour cream, cover and refrigerate. Drizzle or apply generously to enchiladas for a nice contrast of color and to mellow some of the pungent flavor. 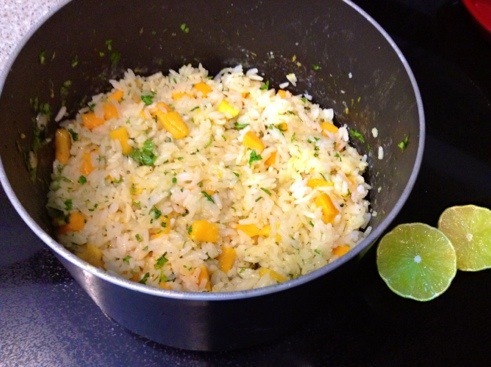 The mango-cilantro rice could not be easier. Boil 2 cups of water and 1 cup of jasmine rice. 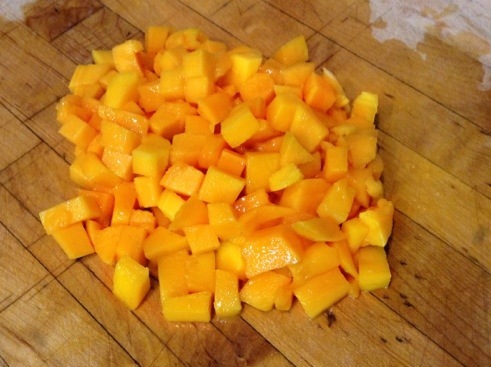 Peel and slice a mango into slices and then into cubes. 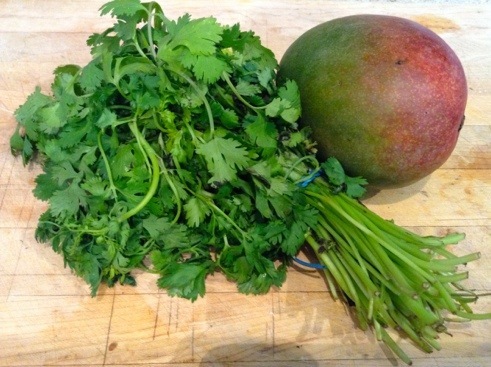 Rough chop cilantro and add both to cooked rice. Squeeze fresh lime juice into the rice and fluff with a fork. Perfection. Start by cooking the chicken first. A pre cut chicken added to 8-10 cups water set on medium heat will begin our broth. 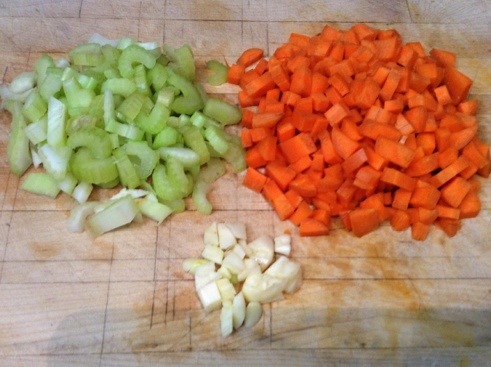 …and give everything a good chop and quarter the onion. Simply add all chopped vegetables, ancho chiles, and about 10 peppercorns to the boiling chicken. 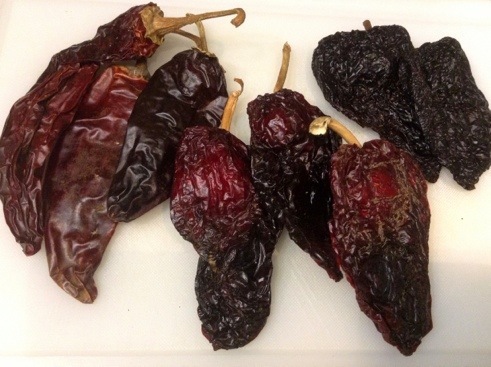 It’s all about the chiles in mole, Folks. 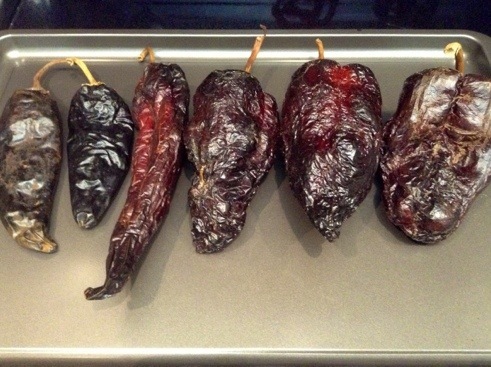 These are dried ancho, pasilla, and guajillo chiles. 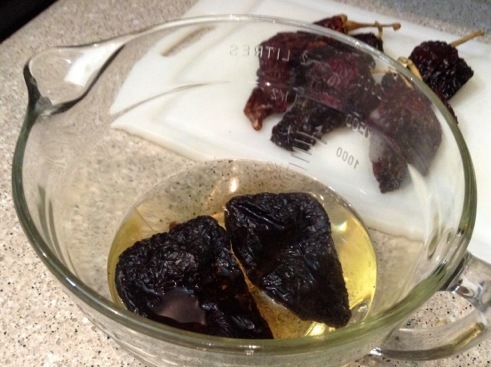 Dried chiles can be rehydrated by immersing them in boiling water before use. 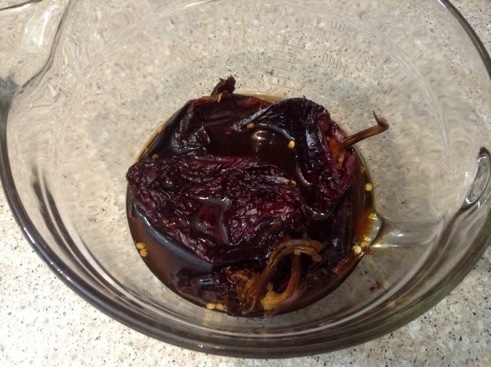 But these ancho chiles are just added to the simmering chicken stock. 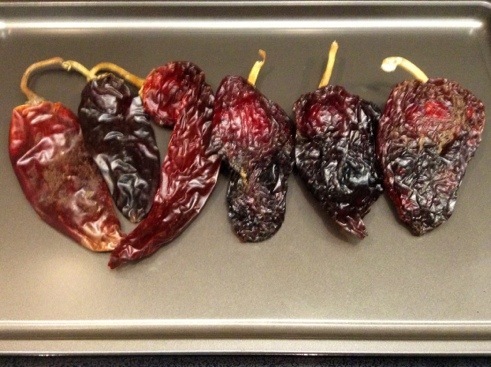 The remaining ancho, pasilla, and guajillo chiles will be baked first at 350 degrees. 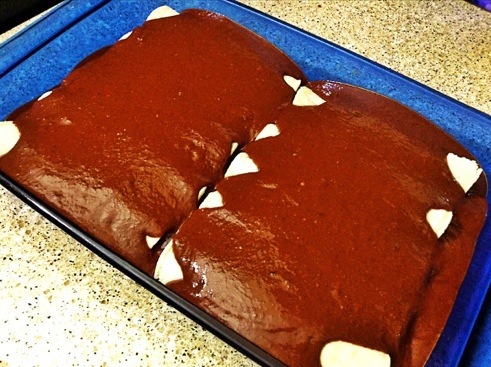 When they puff up in the oven, they are ready. …pressing them into the liquid for 3 minutes or so. With a slotted spoon, remove stems and most of the seeds. 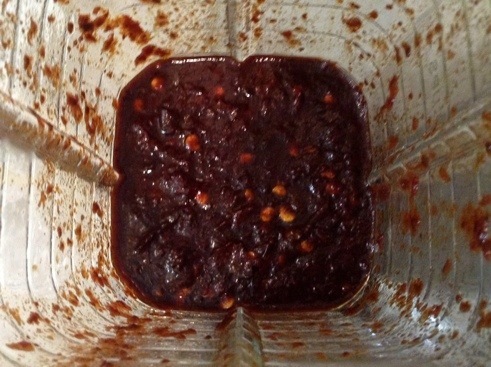 Add remaining liquid and peppers to food processor and blend into a paste. 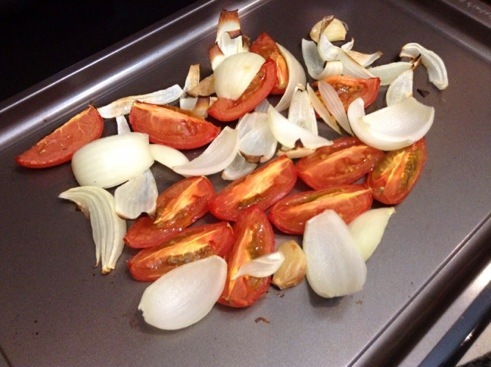 Roast 3 quartered roma tomatoes and an onion. Remove from the oven when the onions begin to color and wilt. 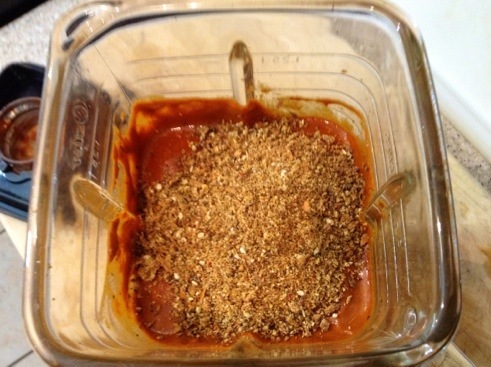 …then blend until there aren’t any visible pieces. 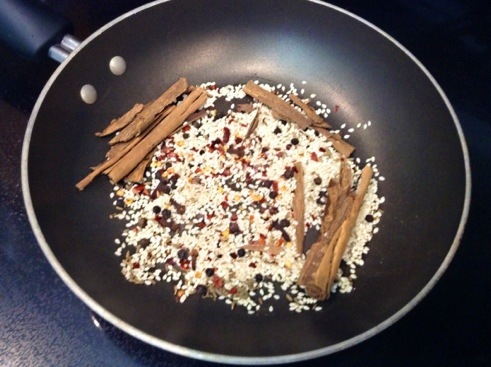 Cloves, peppercorns, red pepper flakes, whole cumin, and sesame seeds are used in this mole. 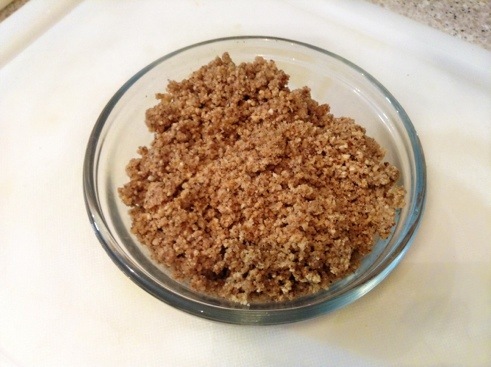 Brown your spices for a couple of minutes, allowing your sesame seeds to toast slightly. 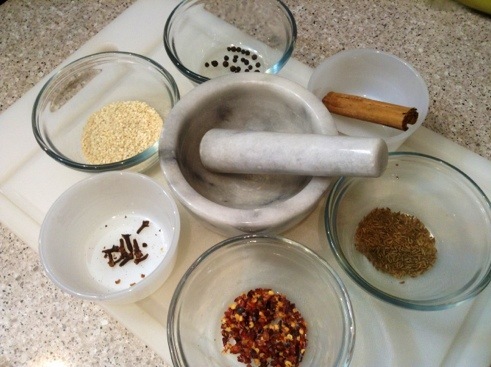 Grind the spices with whatever you have handy. 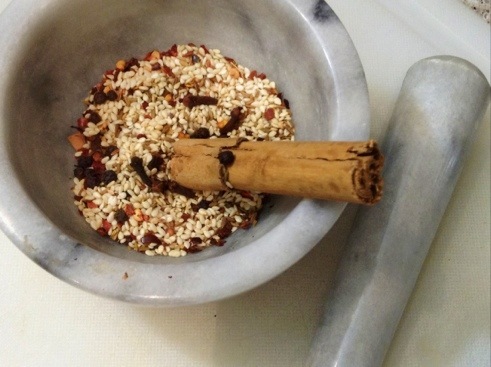 I used a mortar and pestle. And stop when you have a consistency that isn’t too fine. 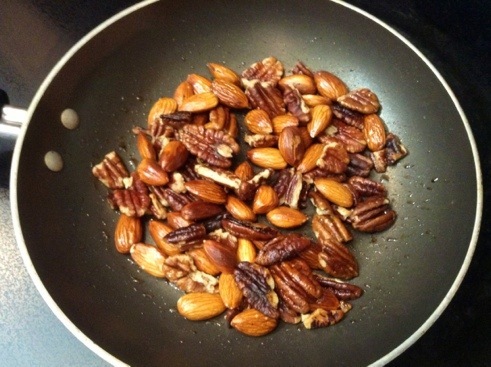 Toast almonds and pecans in a tablespoon of corn oil. You will smell their aroma before they are done but be careful to not burn. 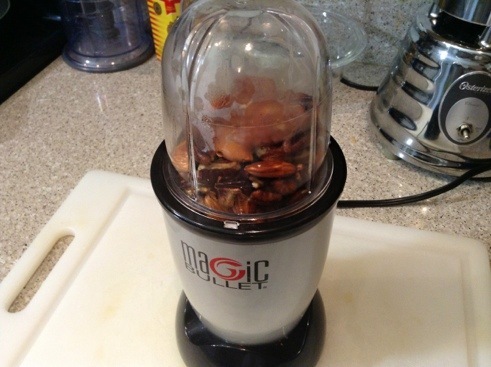 Again, using a grinder, blend the toasted nuts. You want texture but avoid chunkier pieces or turning into it nut butter. Pour the ground nuts into the mole sauce. 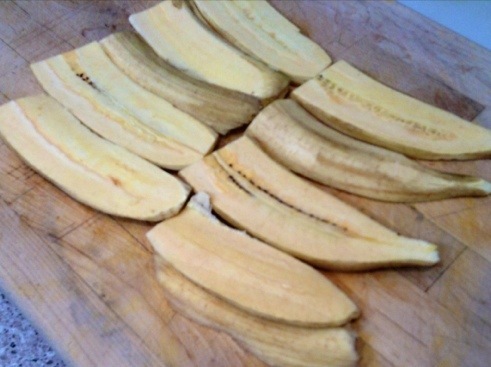 Peel and slice 1 plantain. 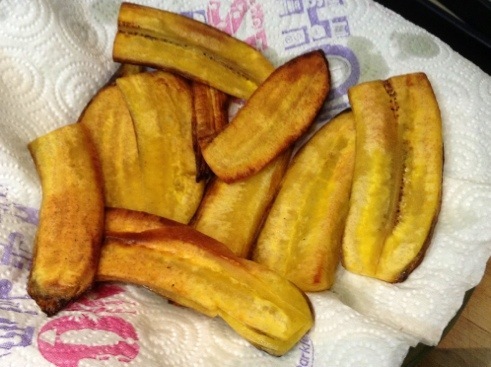 And brown plantain on both sides in a little corn oil. 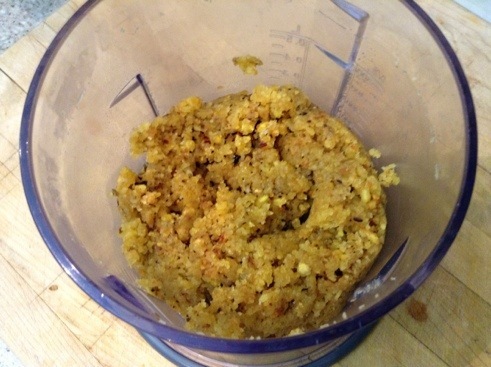 …and allow the excess oil to drain into a paper towel. These golden beauties are indispensable for the moles’ authentic flavor. Give them a good blend first. It’s easier to add them to the sauce this way. 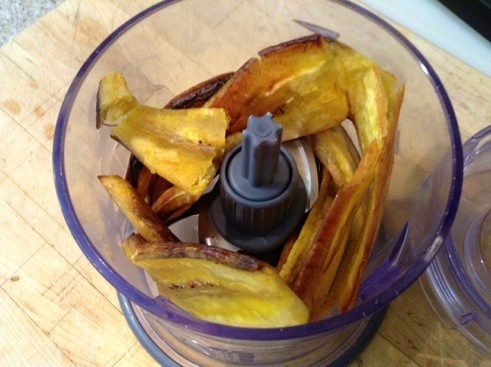 Then toss the plantain into blender or food processor with the mole sauce and blend more. 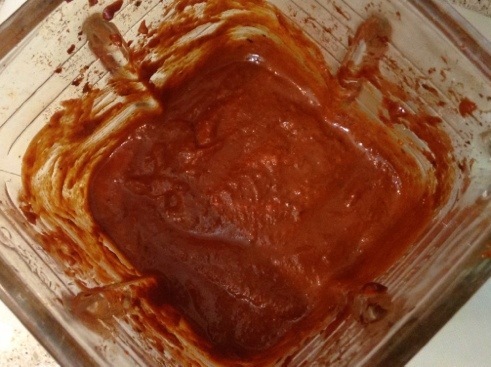 Once everything is completely mixed together, there should be no lumps…just a smooth thick sauce. Don’t forget to sprinkle in the ground roasted spices. Into the mole it goes. 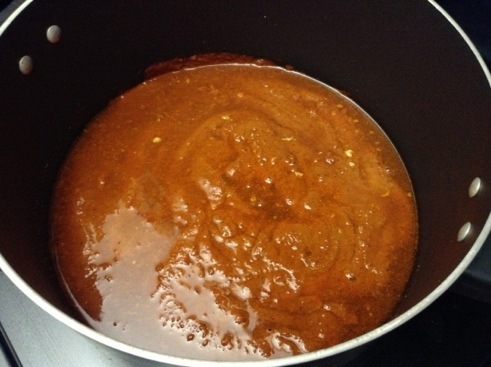 When everything is smooth and thoroughly incorporated, pour the mole sauce into a large pot and add chicken stock to loosen the thick sauce. Arguably the main attraction for my dish. And very easy to find. 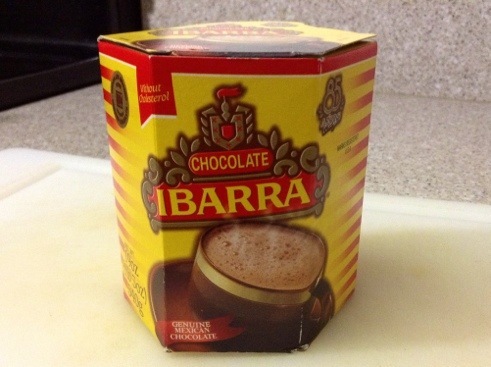 Chop the Mexican chocolate into pieces or simply drop it into the mole sauce. Personally, I used two 3 oz. bars. 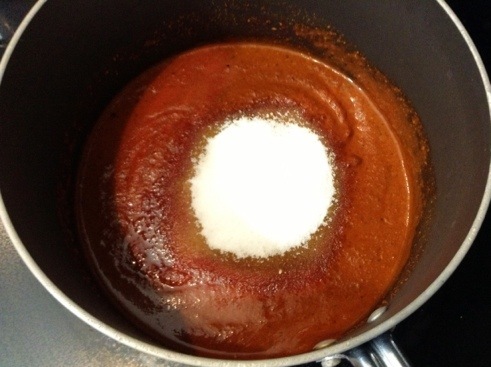 Add about 1/4 cup of sugar and stir into the mole sauce. 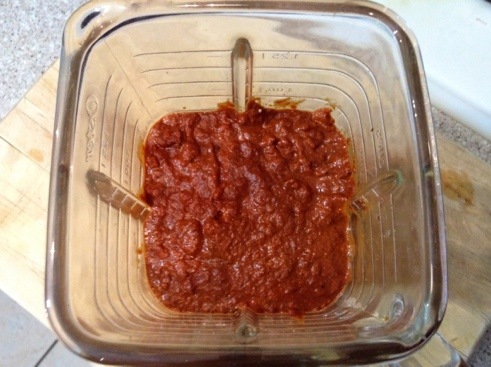 Allow mole sauce to cook low and slow on low or medium-low heat for about an hour. 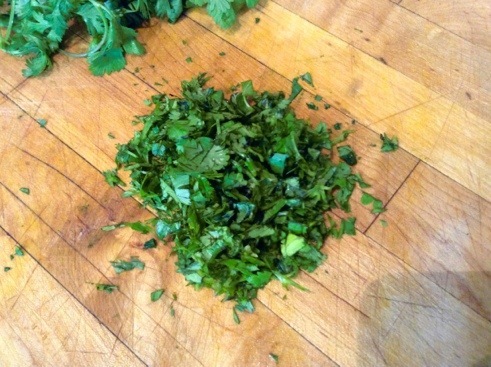 I love fresh cilantro. 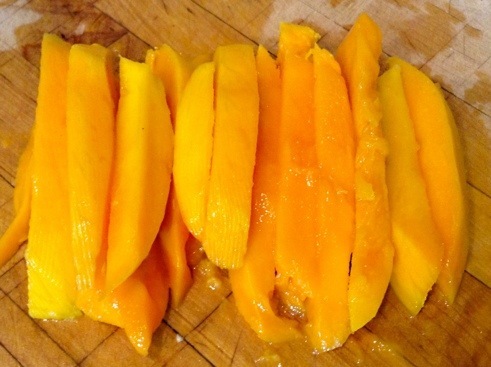 And mango. Easy decision here. 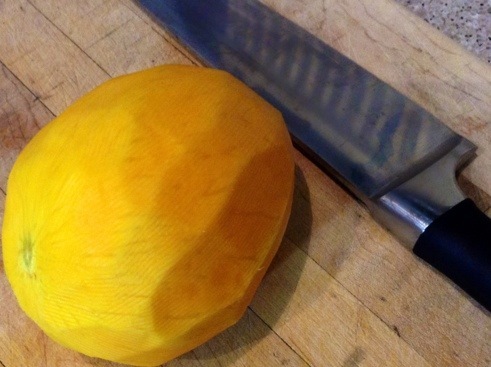 Peel the mango using a potato peeler or similar device. Cut into large slices carefully removing the seed, then cut into strips. 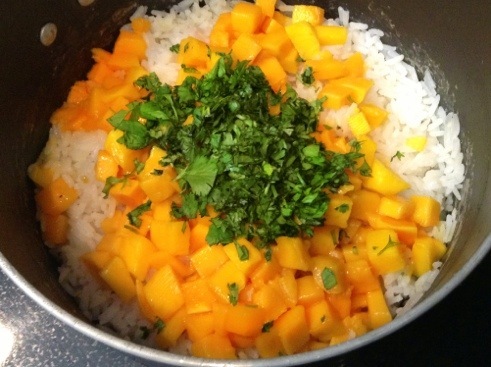 Add mango and cilantro to cooked jasmine rice and fluff with a fork. Squeeze in a small limes worth of juice. I used a slightly overripe Persian lime. 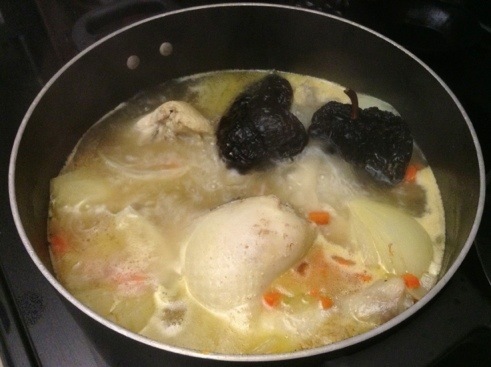 Drain the broth from the chicken and carefully debone. 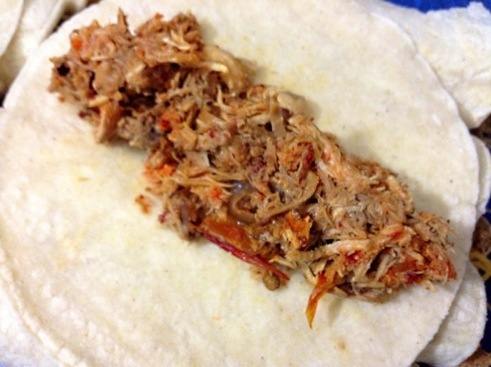 Spread the pulled chicken across the middle of a corn tortilla. Sprinkle liberally with shredded cheese. 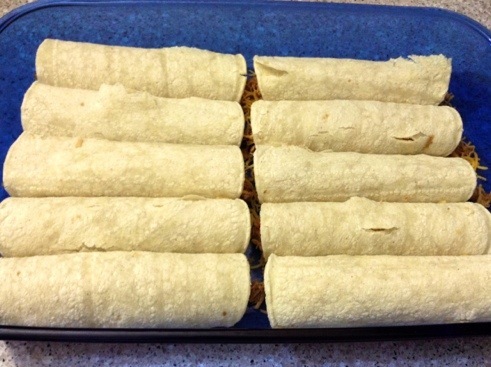 Roll enchiladas into the corners of the baking pan with the seam facing down. Repeat until you have completely filled your pan. Now pour copious amounts of mole sauce onto the enchiladas. I wanted these to be saucy. 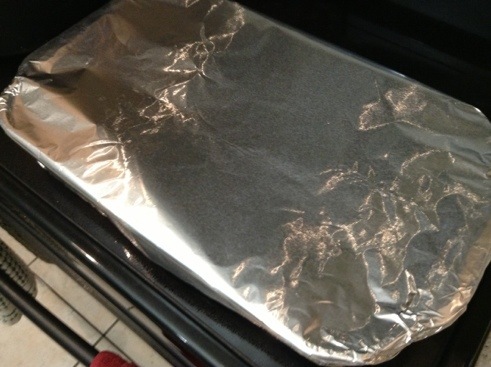 Cover with foil and bake for 20-30minutes. Remove foil half-way through the baking process. Continue to bake at 375 degrees. Once completed, remove from oven and allow to cool slightly. 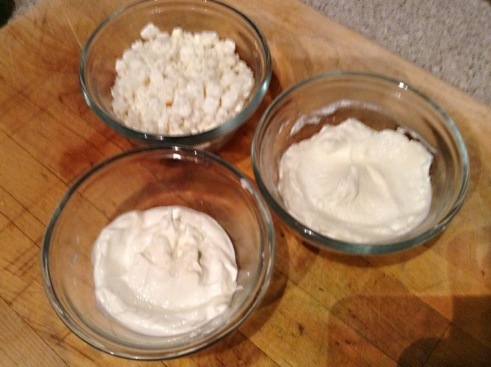 An easy crema: goat cheese (or Oaxaca), sour cream, and Greek yogurt. 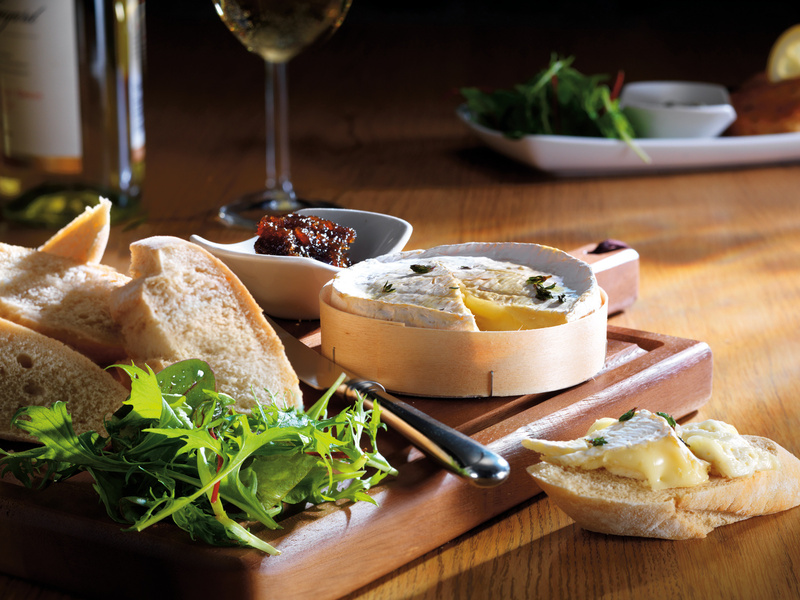 Combine all ingredients and whisk in the crème fraîche until it is creamy and smooth. Cover with plastic wrap until ready to serve. I hope you enjoyed this recipe too! Please leave your comments and favorite mole recipe suggestions! I love your pictures they are so clear…. Thank you for your compliment! I’m still trying some different things but overall I like the way these images came out too. You keep visiting and I’ll keep ‘em coming! What Alicia didn’t eat I did!! Fantastic, authentic and rich!! Put my Mexican mother-in-laws to shame Thank you so much for sharing. YUM!!!! I love the compliments ladies and you’re quite welcome! You could always subtly suggest the recipe to your mother-in-law but I wouldn’t risk it!